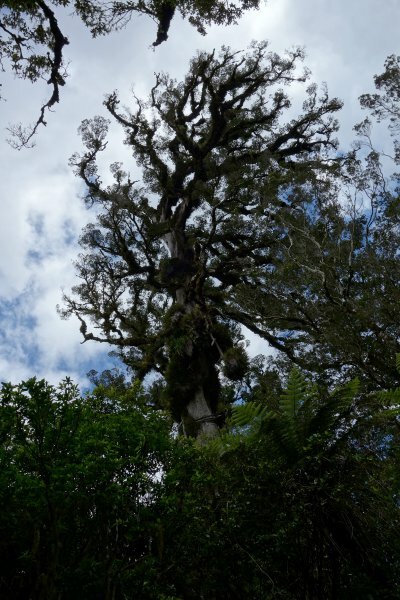 The massive pseudo-trunks of Northen Rata can exceed 6 m in diameter. According to Burstall, S. Percy Smith, later Surveyor-General of New Zealand, measured a specimen at the headwaters of the Waiwhakahio river 20.7 m in girth (approximately 6.5 m in diameter) in 1857. 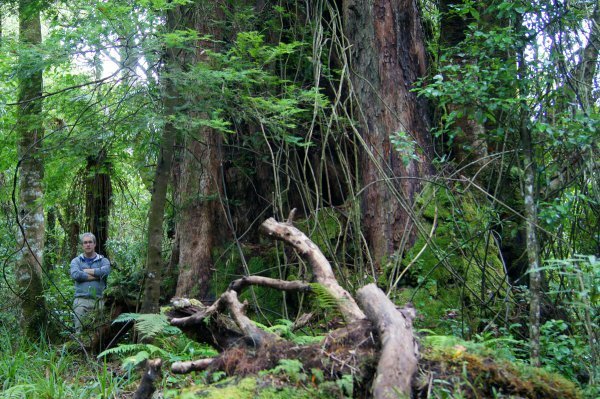 That tree may be long gone, but one of the largest known remaining rata trees is a short walk along the Mangaoraka Loop Track in Egmont National Park, close to the banks of the Waiwhakahio river as it heads down the lower slopes of Mount Taranaki. Almost at the side of the road, the tree is easily reached within a couple of minutes walk from the Mangaoraka car park halfway between the park boundary and North Egmont. The 20 minute loop track through mainly kāmahi forest also includes a couple of long fallen rata trees 2 to 3 m in diameter. Another standing rata, almost as large as the Mangaoraka track tree, is perched on the banks of a small gully, right next to the car park for the Mangaoraka loop track, at the start of the Ngatoro Track to North Egmont. Straight shot from base of tree. Girth measurement at 1.4 m made under a root creating a flying buttress. Actual measurement of 1330 cm had 30 cm subtracted to account for a small kamahi stem that had fused to the rata. Typical old growth rata, with plenty of foliage. Crown leans heavily to one side. 29 Jan 2015 Smillie, M.J.
A couple of minutes walk on the left hand direction from the Mangaoraka loop track entrance across the road from the car park.